Enriched with vast industry experience, we are engaged in offering optimum quality Duct Coupler in industry. 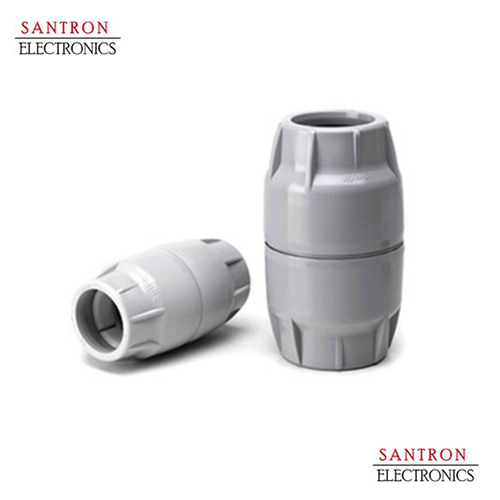 Fabricated from world-class raw materials and modern technologies, these couplers are designed to meet duct pipe connection application requirements. These are available in varied capacities. Our vendors have developed these couplers in adherence with the international quality standards. Santron Telecom Pvt Ltd, an ISO 9001:2008 certified company, was established in the year 2011 and indulged in supplying and importing Telecommunication Hardware including Underground Optical Fiber Cables, RF Cable, LMR Cables, RG Coaxial Cable, etc. We provide Trenching, Laying & Installation of Fiber Optical Cables services also. Located in Delhi, India our firm is striving hard to provide the top grade products in market that are sourced from some genuine and trustworthy vendors of the industry. The products we offer are made in adherence with the international quality standards under the strict control and supervision of the industry experts at manufacturer’ end. Apart from this, our qualitative range of these products is widely demanded and appreciated for their smooth performance, sturdiness, durable finish, corrosion resistance, easier installation and reliability. With the help of our highly qualified and determined professionals, we are able to provide the efficient and trusted solutions to clients that are rendered within the promised time span. We import our products from China.